« What Happens to the eBay Market on March 31st? The easiest way to get repeat buyers is to send out coupons for future purchases. It’s a great way get repeat buyers and to keep them coming back. A quick method to accomplish this is to automate the ENTIRE process. With Vendio, when you choose to automate coupons, buyers from both eBay and your Vendio Store will receive a coupon based on your set preferences and specifications. Coupon Automation is located under Preferences>Promotions. 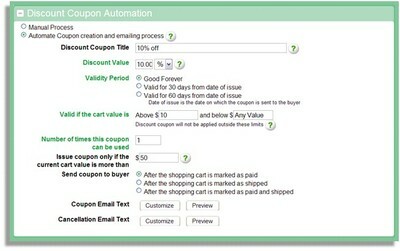 Here’s a breakdown of how to set your criteria for automating coupons. The discount coupon title is not visible to buyers and is for your internal use only. The title is a searchable field that is displayed on the Manage Coupons page. It is generally best to choose a descriptive title that you will remember. For example, you could use titles like “20% off next purchase”, or “$5.00 off next order”. Discount coupon values can be defined in dollar amounts or percentages. When using percentage-based coupons, the discount will be applied to the order total, excluding shipping, handling, and insurance. The validity period defines how long the buyer has to redeem their coupon. You can choose to limit the validity period to 30 or 60 days, or let the coupon remain valid forever. The coupon start date is defined as the date the coupon is sent to the buyer. Expired coupons can be viewed under Promotions > Coupons, using the “Expired” filter. You can limit coupons to apply only to sales within a specific value range by choosing a cart value minimum and maximum. This allows you to control whether a coupon can be applied depending on the cart total. For example, if you offer a $5.00 discount coupon, you may wish to set your minimum cart value to $20.00; likewise, if you offer a 20% discount, and your profit margin decreases for your higher-dollar items, you may wish to set your maximum cart value to a specific amount. Define how many times a buyer can use a coupon. The default value for a coupon is for a single use, but you may extend the coupon to be used multiple times if you wish. You can set a minimum cart value that will be required in order to trigger sending a coupon. For example, you may want to limit discount coupons to buyers who have spent at least $20.00 on an order. In this case, you would enter $20.00 in the box next to “Issue Coupon only if the current cart is more than”. Set the cart condition that will trigger a coupon email to your buyer. You can set the coupon to go out when the shopping cart is marked as paid, as shipped, or as paid and shipped. Note that items are automatically marked as paid when a buyer makes their payment using an integrated service such as PayPal or Authorize.net. You can customize your coupon email under Preferences > Promotions. Click on the customize button next to “Coupon Email Text”. There are two ways to customize your coupon email. You can choose to either edit the pre-created coupon text, or create your own unique coupon by using HTML. Note that Custom Fields can be used with either text or HTML based emails. Custom fields automatically populate the data you defined when creating a coupon into the coupon email, such as discount value and validity period. For example, if you use the [Discount Value] custom field, and you are sending coupons with a 20% discount, the [Discount Value] tag will be replaced with “20%” in the coupon email text. You can change the pre-created coupon email by revising the text, and/or by moving the custom fields to change the layout. When you are satisfied with your changes, click “Save”. You can also use HTML and the custom fields to create a completely customized email. Just click the “view HTML” radio button to edit the raw HTML. We recommend using this option only if you are familiar with using HTML formatting. As a general rule, repeat buyers spend more per ticket than new buyers. Sending coupons is great way to keep them coming back and spending more. This entry was posted on Monday, March 15th, 2010 at 9:07 am	and is filed under Vendio Platform. You can follow any responses to this entry through the RSS 2.0 feed. Both comments and pings are currently closed. Will there be any updates to this feature anytime soon? I love the addition of the coupon codes but I wish we could enter our own code word instead of the generated letters and numbers. Also I would love a free shipping option or a “Spend $$$ get this item free” type of coupon. I have been with vendio for a while and would love to see some updates to this section.